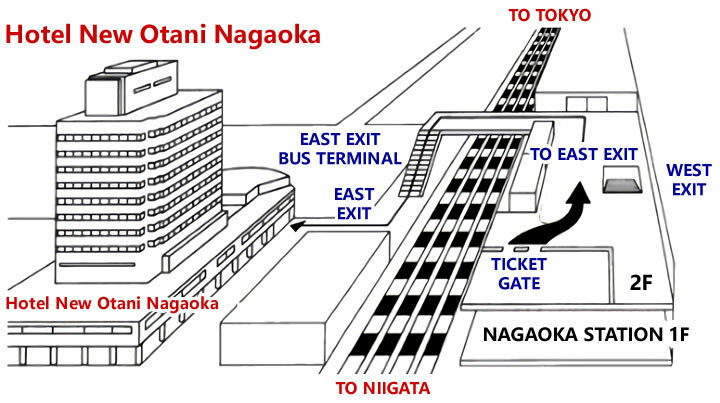 The Hotel New Otani Nagaoka is conveniently located near the east exit of Nagaoka Station. In order to get here, please see the guide below. 90 minutes from Tokyo Station by the Joetsu Shinkansen (bullet train). 25 minutes from Niigata Station by the Joetsu Shinkansen (bullet train). The hotel is a 1 minute walk from the east exit of Nagaoka station. 15 minutes from the Nagaoka I.C. of the Kan-etsu Expressway. 25 minutes drive from the Nakanoshima-mitsuke I.C. of the Hokuriku Expressway. Copyright © Hotel New Otani Nagaoka All Rights Reserved.